Honda’s creative musical road idea was an interesting, fun way to express the connection a car has with its road and what its drivers experience as road, car and driver connect in one simultaneous beautiful experience. To bring that experience to life, Honda cut grooves into a road in southern California and create a YouTube channel featuring the original TV commercial and several documentary short films explaining how it was done. A new online experience on Honda’s Civic shopping website extends the idea in a new way. 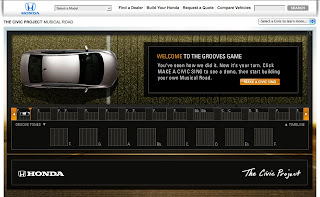 Website users can now create their own virtual musical road where they can plot different notes on a road and playback the version they made on the “Grooves Game” website. The experience is an interesting way to bring new life to the original idea and bring an user generated, interactive experience to make the idea more personal. Of course, to make your own song, that’s worth listening to, it helps to have some musical experience. My ability to create a musical road sounded as muddled as the thuds I hear on my daily “musical” expression on the pothole-ridden roads of Michigan each morning. Supposing you can actually create a new tune that’s worth listening to it is a shame the Honda Grooves Game doesn’t let one share their creation. The only share that can be done is an email sharing form that sends the website link for friends to create their own song. In an age where most sites share through social media properties, it seems odd that Honda didn’t allow for an easy way to make that happen or a simple way to share a person’s own musical road. This would have made the experience more interesting. Perhaps budget or timing prevented such expression. Overall, the idea is great way to extend a real-world idea to a digital idea. Unfortunately, without some stronger social sharing or allowing people to express their own musical roads, the site loses its power to be more compelling.